The news out of Leyte reminds me of my grandparents. Here’s something I wrote about them nearly eight years ago. Here is a prayer book given to me four years ago today by a good friend of the family. Use it, and I know it will do you a lot of good. Will you make it your New Year’s resolution to attend Mass regularly every Sunday? Thank you ever so much. This note and others like it are stuffed inside a greenish-gold box that says “La Jade” and “Paris” over an image of birds in flight. 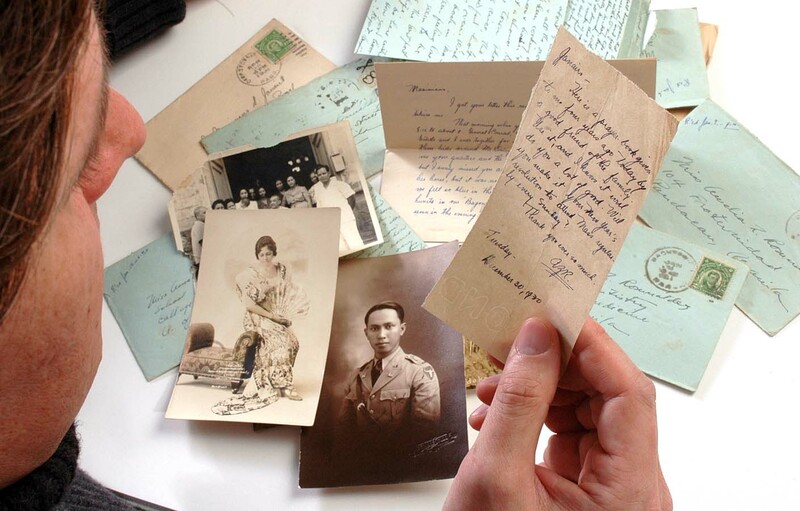 It doesn’t say that it contains the love letters of Lt. Maximiano Saqui Janairo and Amelia Zialcita Romualdez, as they were known in 1930. When they were alive, I hadn’t known this box or these letters existed. Now that I am their caretaker, I turn to them around the anniversaries of my Lolo and Lola’s deaths (he died on Dec. 14, 1997; she died April 2, 1999) to feel connected to them in ways I never had when they were alive. Although the paper is faded, the ink is as vibrant as it was when they were young adults starting out in a world now lost, when the Philippines was a U.S. colony and Manila a jewel more splendid than Hong Kong, Shanghai or Tokyo. My Lola wrote about friends, horse rides, parties, her college studies and her desire to meet again. She wrote many of her notes when she was in class. My Lolo wrote about how busy he was with work, complaining about dust, mud and broken-down trucks. He was a lieutenant in the Philippine Scouts, having graduated from West Point a few months before, and was stationed outside Manila at Fort William McKinley. His notes came from there and other places, like Fort Stotsenburg (later Clark Air Field) and Mariveles on the Bataan Peninsula, where my Lolo would be captured by the Japanese and forced to march to a prisoner of war camp. But I’m getting ahead of myself. That happens in 1942. One of the problems with these notes is that I can’t read them without already knowing my grandparents’ futures. The trick is to let their correspondences speak for themselves. The note above, for example, is especially poignant, because it is the first written trace of their connection, a genesis for my family that, although short and seemingly direct, abounds with mystery. Why, for example, is her salutation just his last name? This doesn’t seem proper, especially for a young woman whose father had once been the mayor of Manila. Was she trying not to give too much away with a word like Dear , or to sound too intimate with his first name, or too formal with a title such as “Mr.” or “Lt.”? Or was her ever-vigilant mother watching? My Lola came from a class and a time when a young woman would never be alone with a young man. Perhaps that chaperoning extended to note writing, and that’s why she wrote so many surreptitiously in class. Then there’s the gift. I should say here that the date is significant her 19th birthday. So she is actually “regifting” a previous birthday present. Was it something she valued? Or something she could easily part with? Why would she be giving away something on her birthday? And why a prayer book? My Lolo and Lola were devout Roman Catholics, but this gift seems to imply she was worried about him. My Lolo was 25 years old then and had been back in the Philippines for only a few months. I know from a video taken in the late 1980s with a West Point historian that he had difficulty adjusting to life in the United States. But did he also have a hard time re-adjusting to his homeland? Was he, at least psychologically, what his grandchildren would be, a hybrid of America and the Philippines? Perhaps he had returned to the Philippines with an American kind of bravado, which had overpowered the restraint and reserve that had served him so well during his youth. After all, he had gone from a fishing village in provincial Cavite to the rarefied realm of a free university education at West Point. Wouldn’t that go to his head? A possible answer is in a later note, one from Jan. 19, 1931, in which my Lola implores my Lolo not to call her “dearest” in front of others. In that note, she takes it upon herself to represent “we Filipinos” and how they expect people to behave so they don’t arouse gossip, that great Filipino pastime. Perhaps she felt comfortable taking this stance, which contrasts her elite background with his humble roots, because she had been Ms. Leyte 1927, during the Philippines’ second national beauty pageant. All this emphasis on societal rules and constraints, however, puts the prayer book in a new light. My Lola wasn’t dumb. She knew that a prayer book was innocent and pure and wouldn’t set tongues wagging. Yet, perhaps she also knew that it would be a physical reminder, a proxy presence of herself that my Lolo could hold in his hands. A final mystery: Why are the notes in English? English, of course, was the language of the American colonial rulers, of the educated and the elite. But Spanish was also the language of the elite, as it had been for 350 years before the Americans showed up, and they were both fluent in it. Perhaps under American rule, Spanish had gone out of fashion? The thing is, neither English nor Spanish was their first language. In fact, they didn’t even share native tongues. My Lolo’s was Tagalog, the principal language on Luzon, the Philippines’ main island. My Lola’s was Waray-Waray, the language of the island of Leyte. And when I knew them, their conversations with each other and other older relatives were often a mixture of Tagalog and English. Perhaps English felt foreign and gave them a layer of protection between their hearts and their hearts’ expressions. Perhaps it let them say things they couldn’t otherwise, as if they were play-acting at being lovers while at the same time hoping and knowing that the consequences would be real. Although I’ve had their notes, letters and telegrams for years, I haven’t read them all. They aren’t easy to read. There’s so much I’m learning about my grandparents and about myself. Each note is a gift that allows many openings into their lives. And all I can say is: Thank you ever so much.